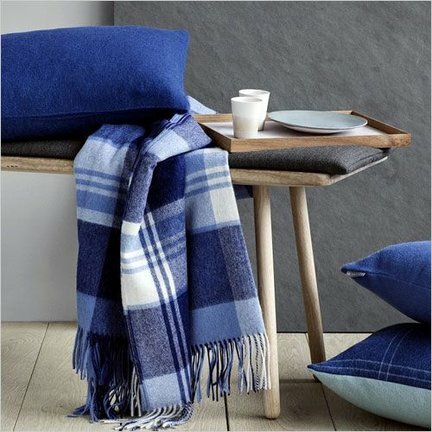 Place a beautiful plaid over your sofa or chair and enjoy the delicious warmth and soft material. Wide choice of beautiful Scandinavian plaids, in plain colour or colourful. Plaids are ideal home accessories. Nicely warm and very decorative. That's why we have a large collection of beautiful brands like Elvang Denmark, Simon Key Bertman, Tina Ratzer and Funky Doris in stock. You can choose from dozens of Scandinavian plaids: from wool or cotton. With cheerful colours and graphic patterns, or flat. So that you can always find a suitable plaid for your interior. What a delightful idea of laying on the couch in the evening with such a soft blanket...♥. Did you know that you can also use plaids in spring and even summer? Wool is breathable and does not sweat. That's why you often see blankets and plaids ready on terraces in summer. When it cools down in the evening it is nice to feel the extra warmth of a plaid. And the fine fibres of wool feel very comfortable on your skin. Personal tip: Place a plaid over your duvet if it is still cold at night. That is not' heavy' and you don't sweat through the extra layer of wool.